This article is about various sports known as football. For information about American football, see football (American). Football is the name given to a number of different team sports. The most popular of these worldwide is association football (also known as soccer). The English word "football" is also applied to American football, Australian rules football, Canadian football, Gaelic football, rugby football (rugby league, and rugby union) and related games. Each of these codes (games played with specific sets of rules) is referred to as "football." The varying forms of football have several aspects in common. They all employ a large spherical or spheroid ball called a football, used by a team scoring goals and/or points by moving the ball to an opposing team's end of the field and either into a goal area, or over a line. Players are required to move the ball mostly by kicking and—in some codes—carrying and/or passing the ball by hand toward the goal and/or line being defended by the opposing team. Goals or points result from players putting the ball between two goalposts or over the goal line. Football-like games were a prehistoric activity. Later, the Ancient Chinese, Japanese, Ancient Greeks, Romans, Persians, and the Aztecs are known to have played various forms of football. 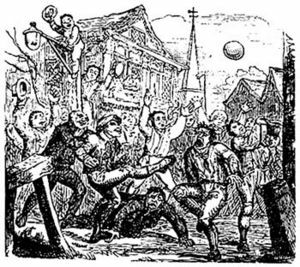 In the Middle Ages, "mob football" matches using a pig’s bladder and pitting villages against each other were popular throughout Europe. The first detailed description of football in England was given by William FitzStephen in about 1174-1183, while the first references to "goals" were in the late-sixteenth century and early-seventeenth centuries. In the sixteenth century, the city of Florence played a game that today is known as "'calcio storico'" ("historic kickball"). The earliest code of rules for any football game may be Count Giovanni de' Bardi di Vernio's Discorso sopra 'l giuoco del Calcio Fiorentino, written in 1580. Over the years, various attempts were made to systematize the rules of football, resulting in the several "codes" which exist today. While it is widely believed that the word "football" originated in reference to the action of a foot kicking a ball, there is an alternative explanation, which has it that football originally referred to games in medieval Europe which were played on foot as opposed to on horseback. Globally, the word "football" usually refers to association football, also called soccer, as this is the most widely played type of football. The name "soccer" was originally a slang abbreviation derived from "association" and is now the prevailing term in the United States, Canada, Australia and New Zealand, where other types of football are dominant. Football-like games predate recorded history in all parts of the world, and thus the earliest forms of football are not known. Documented evidence of an activity resembling football can be found in a Chinese military manual written during the Warring States Period in about the 476 B.C.E.-221 B.C.E. It describes a practice known as cuju, which involved kicking a leather ball through a hole in a piece of silk cloth strung between two 30-foot poles. The Ancient Greeks and Romans are known to have played many ball games, some of which involved the use of the feet. The Roman writer Cicero describes the case of a man who was killed while having a shave when a ball was kicked into a barber's shop. The Roman game harpastum is believed to have been adapted from a team game known as "επισκυρος" (episkyros) or pheninda that is mentioned by Greek playwright, Antiphanes (388-311 B.C.E. ), and later referred to by Clement of Alexandria. These games appear to have resembled rugby. Kemari being played at the Tanzan Shrine, Japan. 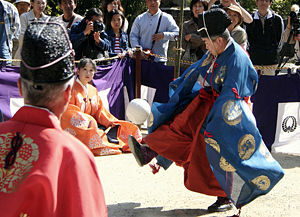 Another Asian ball-kicking game, which was influenced by cuju, is kemari. This is known to have been played within the Japanese imperial court in Kyoto from about 600 C.E. In kemari several people stand in a circle and kick a ball to each other, trying not to let the ball drop to the ground. The game appears to have died out sometime before the mid-nineteenth century. It was revived in 1903, and it can now be seen played for the benefit of tourists at a number of festivals. There are a number of references to traditional, ancient ball games played by indigenous peoples in many different parts of the world. For example, in 1586 C.E., men from a ship commanded by an English explorer named John Davis went ashore to play a form of football with Inuit (Eskimo) people in Greenland. There are later accounts of an Inuit game played on ice, called Aqsaqtuk. Each match began with two teams facing each other in parallel lines, before attempting to kick the ball through each other team's line and then at a goal. In 1610, William Strachey of Virginia's Jamestown settlement recorded a football game played by Native Americans, called Pahsaheman. In Victoria, Australia, indigenous people played a game called Marn Grook ("ball game"). An 1878 book by Robert Brough-Smyth describes this game as involving drop-kicking "a ball made from the skin of a possum" and "players leap[ing] into the air in order to catch it"—not dissimilar to what occurs in Australian Rules football today. As with all Mesoamerican cultures, the Aztecs played a variant of the Mesoamerican football game named tlachtli or ollamaliztli. The game was played with a ball of solid rubber, called an olli. The players hit the ball with their hips, knees, and elbows and had to pass the ball through a stone ring to automatically win. One known fact was losing meant disgrace in the Aztec empire so bloody brawls could break out during games. These games and others may well go far back into antiquity and may have influenced later football games. However, the main sources of modern football codes appear to lie in western Europe, especially England. The Middle Ages saw a huge rise in popularity of annual "mob football" matches throughout Europe, particularly in England. Often held at the pre-Lenten festival of Shrovetide in February or March, Shrovetide football may have arrived with the Roman occupation. However, reports of a game played in Brittany, Normandy, and Picardy, known as La Soule or Choule. suggest that some of these football games could have arrived in England as a result of the Norman Conquest in 1066. These archaic forms of football would be played between neighboring towns and villages, involving an unlimited number of players on opposing teams, who would clash in a heaving mass of people struggling to drag an inflated pig's bladder by any means possible to markers at each end of a town. A legendary account states that these games evolved from a more ancient and bloody ritual of kicking an enemy's head instead of a ball, however there is no documentary evidence for this. Shrovetide games have survived into the modern era in a number of English towns. The first detailed description of this type of football in England was given by William FitzStephen around 1174-1183. Other references speak simply of "ball play" or "playing at ball." In 1314, Nicholas de Farndone, Lord Mayor of London issued a decree on behalf of King Edward II banning football. Forasmuch as there is great noise in the city caused by hustling over large balls from which many evils may arise which God forbid; we command and forbid, on behalf of the King, on pain of imprisonment, such game to be used in the city in the future. In 1349, Edward III banned football on a wider basis, stating that such activities distracted the male populace from practicing archery, which was necessary for war. King Henry IV, in 1409, issued a proclamation forbidding the levying of money for "foteball." Between 1324 and 1667, football was banned in England by more than 30 royal and local laws. The need to repeatedly proclaim such laws demonstrated the difficulty in enforcing bans on what must have been a fairly popular game. The first references to goals, goalkeepers, and passing of the ball between players are in the late-sixteenth and early-seventeenth centuries. The first direct reference to scoring a goal is in John Day's play The Blind Beggar of Bethnal Green, performed circa 1600: "I'll play a gole at camp-ball." Similarly, in a poem in 1613, Michael Drayton refers to "when the Ball to throw, And drive it to the Gole, in squadrons forth they goe." By 1608, the local authorities in Manchester were complaining that: "With the ffotebale… [there] hath beene greate disorder in our towne of Manchester we are told, and glasse windowes broken yearlye and spoyled by a companie of lewd and disordered persons …"
A change was in the wind, however, as King James I's Book of Sports (1618) instructs Christians to play at football every Sunday afternoon after worship. 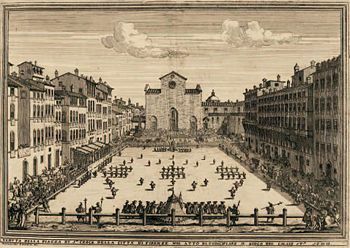 In the sixteenth century, the city of Florence celebrated the period between Epiphany and Lent by playing a game which today is known as "calcio storico" ("historic kickball") in the Piazza della Novere or the Piazza Santa Croce. The young aristocrats of the city would dress up in fine silk costumes and embroil themselves in a violent form of football. For example, calcio players could punch, shoulder charge, and kick opponents. Blows below the belt were allowed. The game is said to have originated as a military training exercise. The earliest code of rules for any football game may have been Count Giovanni de' Bardi di Vernio's Discorso sopra 'l giuoco del Calcio Fiorentino, written in 1580. The game was not played after January 1739, until it was revived in May 1930. While football continued to be played in various forms throughout Britain, its public schools (known as private schools in other countries) are widely credited with four key achievements in the creation of modern football codes. First, they were important in taking football away from its "mob" form and turning it into an organized team sport. Second, many early descriptions of football were recorded by people who had studied at these schools. Third, it was teachers, students, and former students from these schools who first codified football games, to enable matches to be played between schools. Finally, it was at British public schools that the division between games involving kicking only and games allowing running with (or "carrying") the ball first became clear. Richard Mulcaster, a student at Eton College in the early sixteenth century and later headmaster at other English schools, has been described as “the greatest sixteenth Century advocate of football." In 1633, David Wedderburn, a teacher from Aberdeen, mentioned elements of modern football games in a short Latin textbook called Vocabula. Wedderburn refers to "keeping goal" and makes an allusion to passing the ball. There is a reference to "get hold of the ball," suggesting that some handling was allowed. It also is clear that the tackles allowed included the charging and holding of opposing players. A more detailed description of football is given in Francis Willughby's Book of Games, written in about 1660. Willughby is the first to describe goals and a distinct playing field: "a close that has a gate at either end. The gates are called Goals." His book includes a diagram illustrating a football field. He also mentions tactics ("leaving some of their best players to guard the goal"); scoring ("they that can strike the ball through their opponents' goal first win"); and the way teams were selected ("the players being equally divided according to their strength and nimbleness"). He is the first to describe a "law" of football: "they must not strike [an opponent's leg] higher than the ball." During the late-eighteenth century, English public schools devised the first offside rules. In the earliest manifestations of these rules, players were "off their side" if they positioned themselves between the ball and the opponents' goal. Players were not allowed to pass the ball forward, either by foot or by hand. They could dribble the ball forward with their feet or advance it in a scrum or similar formation. However, offside laws began to diverge and develop differently at the each school. 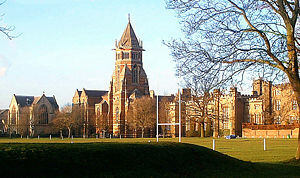 Rugby School, which developed football rules for the game which is named after the school. By the early nineteenth century, football was adopted by a number of public schools as a way of encouraging competitiveness and keeping youths fit. Each school drafted its own rules, which varied widely and were changed over time with each new intake of pupils. Two main schools of thought developed regarding rules. Some schools favored a game in which the ball could be carried (as at Rugby, Marlborough and Cheltenham), while others preferred a game where kicking was promoted and running with the ball was not allowed (as at Eton, Harrow, Westminster, and Charterhouse). During this period, the Rugby school rules appear to have gained fairly wide acceptance for the "running" game. 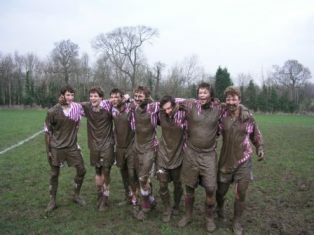 Two early non-university clubs are strongholds of rugby football: the Barnes Club, and Guy's Hospital Football Club. These clubs claim to date back to 1839 and 1843, respectively, but without clear documentation. In 1845, three boys at Rugby were tasked with codifying the rules then being used at the school. These were the first known set of written rules for any form of football in England and further assisted the spread of the Rugby game. For instance, Dublin University Football Club—founded at Trinity College, Dublin in 1854 and later famous as a bastion of the Rugby School game—is the world's oldest documented football club in any code. In 1848, at Cambridge University, H. de Winton and J.C. Thring called a football conference at Trinity College, Cambridge with 12 other representatives, representing Eton, Harrow, Rugby, Winchester, and Shrewsbury. An eight-hour meeting produced what amounted to the first set of modern football laws, known as the Cambridge rules. No copy of these exact rules now exists, but a revised version from circa 1856 is held in the library of Shrewsbury School. Cambridge rules clearly favored the "kicking game." Handling was only allowed for a player to take a "clean catch" entitling him to a free kick. There was also a primitive offside rule, disallowing players from "loitering" around the opponents' goal. The Cambridge rules were not widely adopted outside English public schools and universities, but they were arguably the most significant influence on the Football Association committee members who were later responsible for formulating the rules of Association football. In Europe, early footballs were made out of inflated animal bladders, more specifically pig's bladders. Later leather coverings were introduced to allow the ball to keep its shape. 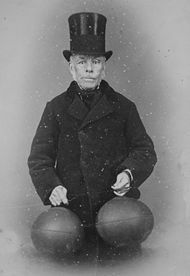 In 1851, Richard Lindon and William Gilbert, shoemakers from the town of Rugby, exhibited both round and oval-shaped balls at the Great Exhibition in London. Lindon won medals for the invention of the "Rubber inflatable Bladder" and the "Brass Hand Pump." In 1855, the U.S. inventor Charles Goodyear—who had patented vulcanized rubber—exhibited a spherical football, with an exterior of vulcanized rubber panels, at the Paris Exhibition Universelle. The ball was to prove popular in early forms of football in America. By the late 1850s, many football clubs had been formed throughout the English-speaking world, to play various codes of football. The Sheffield Football Club, founded in 1857 in the English city of Sheffield by former Harrow School pupils Nathaniel Creswick and William Prest, is recognized as the world's oldest club playing association football, or soccer. The club initially played its own code: the Sheffield rules. These were similar to the Cambridge rules, but players were allowed to push or hit the ball with their hands, and there was no "offside" rule, so that players could be permanently positioned near the opponents' goal. The code spread to a number of clubs in the area and was popular until the 1870s. 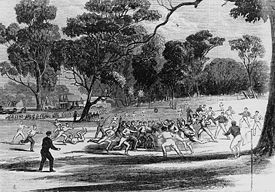 An Australian rules football match at the Richmond Paddock, Melbourne, in 1866. The invention of Australian rules football is usually attributed to Tom Wills, who published a letter in Bell's Life in Victoria & Sporting Chronicle, on July 10, 1858, calling for a "foot-ball club" with a "code of laws" to keep cricketers fit during winter. Wills had been educated in England at Rugby School, and had played cricket for Cambridge University. The extent to which he was influenced by the various British and Irish football games is unknown, but there were similarities between some of them and his game. Australian football also has similarities to the Australian Aboriginal game of Marn Grook, which he reportedly witnessed as a child in western Victoria. On July 31, 1858, Wills and people responding to his letter met and experimented with various forms of football. The Melbourne Football Club is the oldest surviving Australian football club, but the rules it used during its first season are unknown. On May 17, 1859 members of the club drew up the first set of laws for Australian rules football. A free kick was awarded for a mark (clean catch). Running while holding the ball was allowed. Although not specified in the rules, the ball to be used was a rugby ball. The club shared many members with the Melbourne Cricket Club, which used cricket ovals which are much larger than other football fields and became the standard field for Australian rules. The 1859 rules did not include some elements which would soon become important to the game, such as the requirement to bounce the ball while running. Australian rules is sometimes said to be the first form of football to be codified. However, as with English football, there was no official body supporting the rules, and play varied from one club to another. By 1866, however, several clubs in the Colony of Victoria had agreed to play an updated version of the Melbourne rules, which were later known as "Victorian Rules" and "Australian Rules." The formal name of the code later became Australian rules football (and, more recently, Australian football). By the end of the nineteenth century, the code had spread to the other Australian colonies and around other parts of the world. However, rugby football would remain more popular in New South Wales and Queensland. During the early 1860s, there were increasing attempts in England to unify and reconcile the various public school games. In 1862, J. C. Thring, who had been one of the driving forces behind the original Cambridge Rules, issued a set of rules of what he called "The Simplest Game," also known as the Uppingham Rules. In October 1863, another new revised version of the Cambridge Rules was drawn up by a seven-member committee representing former pupils from Harrow, Shrewsbury, Eton, Rugby, Marlborough, and Westminster. On October 26, 1863, representatives of several football clubs in the London Metropolitan area met for the inaugural meeting of The Football Association (FA). The aim of the FA was to establish a single unifying code and regulate the playing of the game among its members. Following the first meeting, the public schools were invited to join the association. All of them declined except Charterhouse and Uppingham. In total, six meetings of the FA were held between October and December 1863. Although a milestone in the development of association football (soccer), the first FA rules still contained elements that are no longer part of football, but which are still recognizable in other games. For example, a player was allowed to make a fair catch and claim a "mark," which entitled him to a free kick. A rugby scrum in 1871. Meanwhile, by 1870, there were about 75 clubs playing variations of the Rugby school game in Britain. There were also rugby clubs in Ireland, Australia, Canada and New Zealand. However, there was still no generally accepted set of rules for rugby until 1871, when 21 clubs from London came together to form the Rugby Football Union (RFU). The first official RFU rules were adopted in June 1871. These rules allowed catching and passing the ball (but not forward) with the hands, and also included the try, where touching the ball over the line allowed an attempt at goal. However, drop-goals from marks and general play, together with penalty conversions, were still the main forms of scoring. The International Rugby Football Board (IRFB) was founded in 1886, but rifts were already beginning to emerge in the code. Professionalism was also beginning to creep into the various codes of football, creating tension with rugby's origins in schools for the sons of the upper classes. By the 1890s, a long-standing Rugby Football Union ban on professional players was causing regional tensions, as many players in northern England were working class and could not afford to take time off to train, travel, play, and recover from injuries. A similar phenomenon had occurred 10 years earlier in northern English soccer, but the RFU authorities reacted differently, taking a hard line against anything but amateur play. In 1895, following a dispute about a player being paid for loss of wages, representatives of the northern clubs met in Huddersfield to form the Northern Rugby Football Union (NRFU). The new body initially permitted only wage replacement payments. However, within two years, NRFU players could be paid for their play, as long as they also held a job outside the sport. The demands of a professional league dictated that rugby had to become a better "spectator" sport in order to sell more tickets to fans. Within a few years the NRFU rules had started to diverge from the RFU, mainly to reduce time spent in scrums, where fans could not see the progress of the ball clearly. The two formerly separate Lancashire and Yorkshire competitions of the NRFU merged in 1901, forming the Northern Rugby League, the first time the name "rugby league" was used officially in England. Meanwhile, RFU rugby, played by clubs which remained affiliated to the IRFB, became known as rugby union football or simply rugby union. Rugby league rules diverged significantly from rugby union rules in 1906, with the reduction of the team from 15 to 13 players. In 1907, a New Zealand professional rugby team toured Australia and Britain, receiving an enthusiastic response, and professional rugby leagues were launched in Australia the following year. However, the rules of professional games varied from one country to another, and negotiations between various national bodies were required to fix the exact rules for each international match. This situation endured until 1948, when at the instigation of the French league, the Rugby League International Federation (RLIF) was formed at a meeting in Bordeaux. During the second half of twentieth century, rugby rules changed further. In 1966, rugby league officials borrowed the American football concept of downs. Thus, a team could retain possession of the ball for no more than four tackles. The maximum number of tackles was increased to six in 1971. With the advent of full-time professionals in the early 1990s, and the consequent speeding up of the game, various other changes were instituted. The laws of rugby union also changed significantly during the twentieth century. In particular, goals from marks were abolished, kicks directly into touch from outside the 22-meter line were penalized, new laws were put in place to determine who had possession following an inconclusive ruck or maul, and the lifting of players in line-outs was legalized. 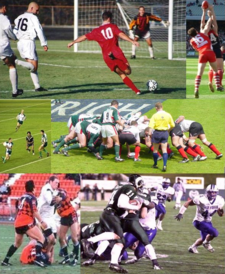 In 1995, rugby union became an "open" game that allowed professional players. Although the original dispute between the two codes has thus disappeared, the rules and cultures of both codes make a union between them unlikely in the near future. As was the case in Britain, by the early nineteenth century, North American schools and universities played their own local games, between sides made up of students. Although football games were played in North America from the days of the earliest settlers, the first official game of rugby in Canada is generally said to have taken place in Montreal, in 1865, when British Army officers played local civilians. The game gradually gained a following, and the Montreal Football Club was formed in 1868, the first recorded football club in Canada. 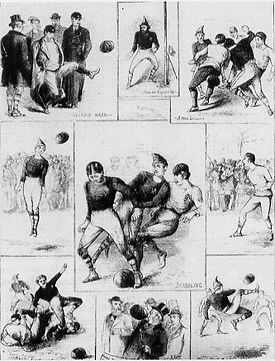 In 1869, the first official game played in the United States under rules based on the English FA (soccer) code occurred, between Princeton and Rutgers. This is also often considered to be the first American game of college football, in the sense of a game between colleges, although the eventual form of American football would come from rugby, not soccer. Modern American football grew out of a match between McGill University of Montreal and Harvard University in 1874. At the time, Harvard students are reported to have played the Boston Game—a running code—rather than the FA-based kicking games then favored by American universities. This made it easy for Harvard to adapt to the rugby-based game played by McGill, and the two teams alternated between their respective sets of rules. Within a few years, however, Harvard had both adopted McGill's rugby rules and had persuaded other American university teams to do the same. In 1876, at the Massasoit Convention, it was agreed by these universities to adopt most of the Rugby Football Union rules. The convention decided that, in the American game, four touchdowns would be worth one goal. 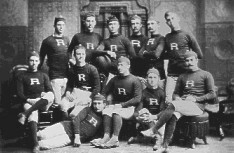 Princeton, Rutgers, and other schools continued to compete using soccer-based rules for a few years, before switching to the rugby-based rules of Harvard and its competitors. American colleges did not generally return to soccer until the early twentieth century. 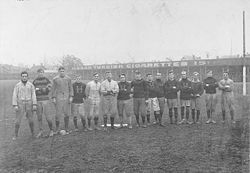 In 1880, Yale coach Walter Camp, devised a number of major changes to the American game, beginning with the reduction of teams from 15 to 11 players, followed by reduction of the field area by almost half, and the introduction of the "scrimmage," in which a player heeled the ball backwards, to begin a game. These were complemented in 1882 by another of Camp's innovations: a team had to surrender possession of the ball if they did not gain five yards after three downs (i.e., tackles). Over the years, Canadian football absorbed some developments in American football, but also retained many unique characteristics. One of these was that Canadian football, for many years, did not officially distinguish itself from rugby. American football was also frequently described as "rugby" in the 1880s. In the mid-nineteenth century, various traditional football games, referred to collectively as caid, remained popular in Ireland, especially in County Kerry. One observer, Father W. Ferris, described two main forms of caid during this period: the "field game" in which the object was to put the ball through arch-like goals, formed from the boughs of two trees; and, the epic "cross-country game," which took up most of the daylight hours of a Sunday on which it was played, and was won by one team taking the ball across a parish boundary. "Wrestling," "holding" opposing players, and carrying the ball were all allowed. By the 1870s, rugby and association football had started to become popular in Ireland, with Trinity College, Dublin being an early stronghold of rugby. On the other hand, the rules of the English FA were being distributed widely. Meanwhile, traditional forms of caid had begun to give way to a "rough-and-tumble game" which allowed tripping. There was no serious attempt to unify and codify Irish varieties of football, until the establishment of the Gaelic Athletic Association (GAA) in 1884. The GAA sought to promote traditional Irish sports, such as hurling and to reject imported games like rugby and soccer. The first Gaelic football rules were drawn up by Maurice Davin and published in the United Ireland magazine on February 7, 1887. Davin's rules showed the influence of games such as hurling and a desire to formalize a distinctly Irish code of football. The prime example of this differentiation was the lack of an offside rule, an attribute which, for many years, was shared only by other Irish games like hurling, and by Australian rules football. The need for a single body to oversee association football (soccer) had become apparent by the beginning of the twentieth century. The English Football Association had chaired many discussions on setting up an international body, but was perceived as making no progress. It fell to associations from seven other European countries: France, Belgium, Denmark, Netherlands, Spain, Sweden, and Switzerland, to form an international association. The Fédération Internationale de Football Association (FIFA) was founded in Paris on May 21, 1904. Its first president was Robert Guérin. The French name and acronym has remained, even outside French-speaking countries. Both rugby and American football were noted at the turn of the twentieth century for serious injuries, as well as the deaths of many players. In America, this had resulted in national controversy, and American football was banned by a number of colleges. Consequently, a series of meetings was held by 19 colleges in 1905–1906. This reputedly occurred at the request of President Theodore Roosevelt. He was considered a fan of the game, but he threatened to ban it unless the rules were modified to reduce the numbers of deaths and disabilities. The meetings are now considered to be the origin of the National Collegiate Athletic Association. The meetings introduced many restrictions on tackling banned mass-formation plays. The changes did not immediately have the desired effect, and 33 American football players were killed during 1908 alone. However, the number of deaths and injuries did gradually decline. Another proposed change was a widening of the playing field. However, Harvard University had just built a new stadium and therefore objected to widening, instead proposing legalization of the forward pass. This proposal was accepted—a change that would dramatically differentiate American and Canadian football from their British predecessors. Today, soccer—or association football—is easily the most popular sport worldwide, so popular that much of Europe practically shuts down during the World Cup. Played at a professional level all over the world, millions of soccer fans regularly go to soccer stadia to follow their favorite team, while billions more watch games on television. In many parts of the world, football evokes great passions and plays an important role in the lives of individual fans, local communities, and even nations. A very large number of people also play soccer at an amateur level. According to a survey conducted by FIFA, over 240 million people regularly play the sport in more than 200 countries in every part of the world. Its simple rules and minimal equipment requirements have no doubt aided its spread and growth in popularity. However, despite repeated efforts to popularize it, soccer has never been as big in the United States, even though an estimated 30 million American youths play the sport. The forward pass distinguishes American football from rugby, its predecessor. Replacing baseball as the great American pastime, American football has become the most popular team support at the high school, college, and professional levels. Football's ascendancy has been aided by the growth of a distinctive fan culture, including "tailgating" (picnicing) in the parking lot; booster clubs; and traveling vast distances for Bowl games or intersectional rivalries, which have become part of the routine for dedicated fans. Moreover, the availability of football through cable and network TV has transformed millions of television viewers, who rarely attend a game, into knowledgeable and enthusiastic football fans. The professional football Hall of Fame is in Canton, Ohio. Arena football has arisen in recent years as an alternative to full scale stadium-based profession American football, featuring a much smaller field, narrower goal posts, and various other rule changes. Unlike professional football, Division I-A football, comprising the most prominent intercollegiate football schools, have no playoff championship. Beginning in 1998, the NCAA initiated the bowl championship system to replace the subjectively selected champion chosen by sportswriters and coaches. Using a variety of methods, including computer ratings, the NCAA chose the top two teams to play in one of the major bowl games, the designations of which rotate from year to year. Critics explain that college football remains the only college or professional sport in which the champion is not chosen by playoffs. Canadian football is similar in most respects to American football, but its rules—including a larger playing field, 12 players instead of 11, and 3 "downs" instead of 4 to attain a "first down"—give much greater emphasis to the forward pass. There are several playing levels of Canadian football, the highest being the professional, eight-team Canadian Football League (CFL). Its champion wins the Grey Cup, the oldest trophy in professional football. The CFL regular season begins in June, and play-offs are completed by mid-November. In cities with outdoor stadiums such as Calgary, Edmonton, Winnipeg, Montreal, Hamilton, and Regina, low temperatures and icy field conditions can seriously affect the outcome of a game. Great achievements in Canadian football are enshrined in the Canadian Football Hall of Fame in Hamilton, Ontario. Amateur football is governed by Football Canada, while at the university level, 27 teams play in four conferences under the auspices of Canadian Interuniversity Sport. The CIS champion is awarded the Vanier Cup. Junior football (played by many after high school before joining the university ranks) consists of 20 junior teams in three divisions in the Canadian Junior Football League, competing for the Canadian Bowl. Semi-professional leagues have grown in popularity in recent years, with the Alberta Football League becoming especially popular. The Canadian Major Football League is the governing body for the semi-professional game. A total of 539,526 registered participants played football in Australia in 2005. Australian Football Commission statistics show a 42-percent increase in the total number of participants over the four-year period between 2001-2005. Australian Rules football is fast growing as an amateur sport in more than 20 countries around the world, with a total of over 25,000 participants outside of Australia in 2004. Australian Rules football is the most highly attended spectator sport in Australia. In 2005, 307,181 attended NAB Cup pre-season matches and 117,552 attended Regional Challenge pre-season practice matches around the country. The AFL is one of only five professional sports leagues in the world with an average attendance above 30,000 (the others are the NFL in the United States and Major League Baseball in the U.S. and Canada, and the top division soccer leagues in Germany and England). In 2006, the national television audience for the AFL Grand Final was a record 3.145 million, including 1.182 million in Melbourne and 759,000 in Sydney. 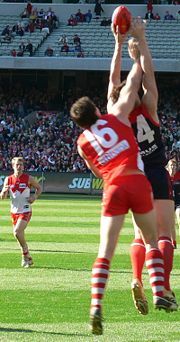 Aussie Rules also has a growing international audience, with 7.5 million North Americans watching Australian Rules Football at least occasionally on television. The AFL Grand Final is broadcast to many countries and attracts millions of viewers worldwide, growing to some 30 million in recent years. The AFL website was the most-visited Australian sports website in 2004. Both Rugby union and Rugby league have international play and world cup tournaments. Rugby is most popular in the United Kingdom, South Africa, Australia, and New Zealand. Since 1987, when rugby World Cup matches were first established, nations have competed for the Webb Ellis Cup, named for the sport's supposed founder. Outside the British Isles, the sport has been popular in Australia, New Zealand, South Africa, France, and Romania. It has gained a measure of recent popularity as a club sport in American colleges, sometimes played in the spring by football players. On a national level, teams are organized on the old Irish-county system, producing 34 teams representing the original 32 counties that cover the island of Ireland, plus teams representing the Irish diaspora in London and New York. There are also clubs in other parts of America, Britain, Asia, Australia, Continental Europe, and Canada. The winning Senior county football team receives the Sam Maguire cup. ↑ An extremely violent variety of football, which was popular in East Anglia. This page was last modified on 7 November 2013, at 15:15.